The Asics Gel Super J33 is the latest from the Asics Gel Super range, a shoe that has always offered fantastic cushioning abilities and natural running positioning thanks to its well designed and comfortable heel. Visually more striking than previous generations whilst offering some rather unique design features in the field of running shoes, this is a highly desirable and thus satisfactory continuation of the Super Gel brand. With the Asics Gel Super J33 comes some of the most distinct looks in the whole Asics line-up. This is a company that has always combined great looks with excellent usability and this is a factor continued upon this generation of the shoe. 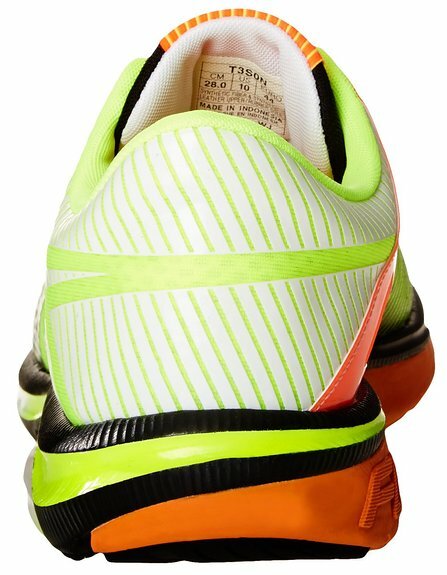 This is one of the most visually distinct shoes that we have seen in a while, being unafraid to combine modern, near luminescent colors across the whole color palette. The patterning of material used is also slightly different from other running shoes, giving the Asics Gel Super J33 a modern, near space age look which, whilst undesirable to some looks fantastic from my perspective. The upper of the Asics Gel Super is thus of an interesting composition. The base material is made of fine mesh that accounts for the breathability aspect of the shoe, whilst the outermost layer is comprised of synthetic material overlays that contribute to the shoe’s appearance. The toe box is typical of Asics in that it is a good roomy fit, feeling spacious whilst supportive and thanks to the inner material when the shoe is laced there is good grip around the midsole of the foot which prevents slipping. If you have wider ankles, then getting your foot in the shoe may be an issue thanks to the narrow entry point, but for most this should not be an issue. The material utilized by Asics for the insole of the Asics Gel Super J33 is also fantastic and really helps to keep your foot in place whilst in motion. The foam material used in the insole is also fantastic, smooth to the touch whilst offering little in the way of blister issues and general uncomfortableness. The support offered by the lateral walls of the shoe is also excellent and one of the best currently on offer from Asics. The sole is where Asics have taken some bold steps and by and large, they work incredibly well. 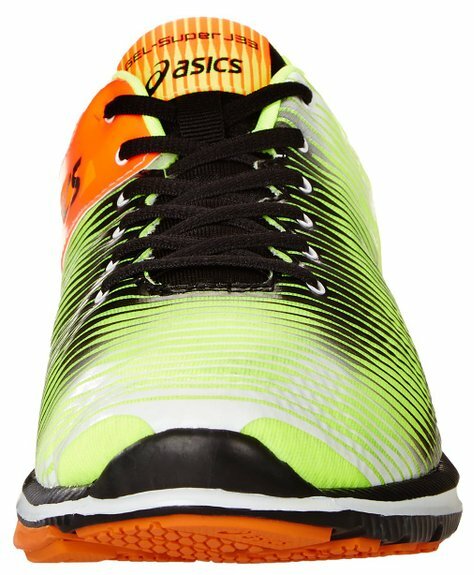 The midsole of the Asics Gel Super J33 is of particular note as it utilizes what Asics have branded as “Fluid Axis” technology, meaning that there is a deep groove cut into the midsole area of the shoe that allows for a much better stance in regards to pronation and other associated issues. This keeps your foot flexible, whilst on the other side of the sole is harder rubber material that keeps your foot in check and stops you pronating too much. In conjunction, they are an effective pairing. The cushioning aspect of the Asics Gel Super J33 is good but we would have liked to have perhaps seen a little more work in this area. Whilst the materials utilized throughout will ensure that you have as comfortable a ride as possible from that standpoint, at the same time in the heel it feels somewhat too stiff over distance, especially if you have a prominent heel strike. This is a shame as cushioning throughout the midsole and forefoot, despite the groove present is very well done and thus suitably flexible. The aforementioned Fluid Axis technology means that the overall flexibility of the shoe is fantastic, offering good control whilst not being too loose at the same time. The strike pattern is good thanks to this factor also, meaning that your foot will not be forced into uncomfortable positions by an overly flexible design. The Asics Gel Super J33 is a fantastic running shoe if you happen to suffer from overpronation, utilising highly effective technology that will keep your foot in check and your running smooth. The heel is a little stiff, but this does not detract from an overall excellent shoe. I hope that this Asics Gel Super J33 review has been helpful!